Gauge: How one project knit by two different knitters equals two different FOs. A story. Have you ever wondered if gauge was really that important? I mean, what difference could it really make in a pattern if you throw caution to the wind and cast on with your favorite needles and yarn? How is it possible for a one skein project to turn into a two skein project, or a sweater knit exactly to pattern come out completely the wrong size? Gauge. Two lovely knitters, MelodyRose and Yarn Assassin decided to conduct an experiment during the first Fickle Zen Knit Along last year. Both decided to knit exactly the same project, using the same yarn and needles and compare their results. The pattern they decided to knit was Fluid Velocity from Fickle Zen Mystery KAL #1. I get questions from time to time from knitters who are perplexed as to why their knit version of one of my patterns ended up using drastically different yardage. Gauge plays a big part in the answer. Since both MelodyRose and Yarn Assassin used the same yarn we don’t have to worry about differences in yarn content. So what that leaves is the types of knit fabric made with the same yarn, knitting needles, and pattern. You would think all those things in common would lead to a similarly sized finished object, right? I can’t think of a single more informative photo on how gauge can shape your final project than the photo above. Using the same needles, yarn, and pattern you can see that the shawls ended up totally different sizes! The smaller of the two is smaller by about a third. Which is pretty amazing if you think about it. 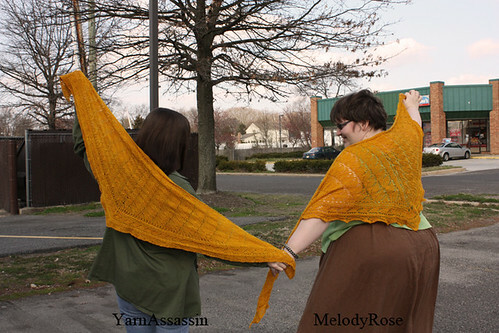 In the end MelodyRose used an additional 80 yards of yarn. Generally speaking, using a smaller needle will give you more of a tight fabric, versus a loser, more open fabric on a larger needle. Both types of fabric have their uses. Bear that in mind when casting on for a new project. And definitely keep it in mind if you are knitting a one skein project. If the finished sample requires 400 yards knit at gauge and your skein of yarn has 400 yards of yarn and you are knitting at a larger gauge you could run out of yarn! Here’s another photo to show the differences, and highlights our awesome models and knitters, Yarn Assassin and MelodyRose. Thanks ladies, for sharing your experiment with us! If you liked what I had to say up above I hope you’ll consider joining us for another Fickle Zen KAL. We’re gearing up for the next Mystery KAL late next month. The sign ups are only open until March 31st and we only have a few spots left. 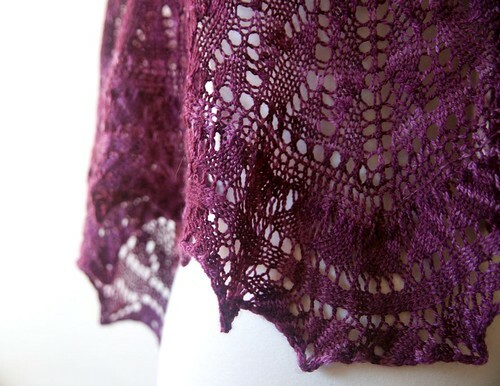 Click here to secure your spot in our next KAL! We’ll be offering weekly video chats during the KAL as well as a special yarn package that will arrive in your mailbox this April. Gauge 20 stitches and 32 rows over 4 inches in Stockinette Stitch. Needles Size US 7/4.5 mm Knitting Needles, or size needed to get gauge. Yarn One 4 Ounce ball of Zen Yarn Garden Serenity Lace II 80% Superwash Merino, 10% Cashmere, 10% Nylon. 575 yards/528 meters. Total yardage: 483 yards/ 443 meters. So that means, using the recommended yarn and needles and AFTER WASHING YOUR SWATCH you should end up with 20 stitches and 32 rows that measures 4 inches wide by 4 inches tall. If the size of the swatch measures SMALLER than 4 inches you need to go up a needle size or two. If the size of the swatch measures LARGER than 4 inches you need to go down a needle size or two. When you change needle sizes you should RESWATCH, rewash your swatch and measure again. Gauge for a lace shawl is not as crucial as a fitted sweater but it can mean the difference between needing one skein of yarn and needing two skeins of yarn. I’ll save the topic of yarn substitution for another time, because between gauge, needle size and the differences in yarn content and how the yarn behaves when knit you have a three body problem. Which becomes infinitely more complex. As a rough guide you can use a spinner’s trick of measuring wraps per inch to compare two yarns. But be forewarned, you had better use a finished (i.e. washed) yarn and hope that your humidity levels are about the same, and that your gauge doesn’t vary over your knitted object. See? Three body problem. 8 Responses to Gauge: How one project knit by two different knitters equals two different FOs. A story. We even used the same size needles! It’s amazing what gauge can do when knit but different people. Thanks for allowing us to be featured! Wow,t hose did turn out differently. Though it does look like the larger one was blocked more aggressively. That or the smaller one has much tighter yarn overs. Ah I can answer that. PArt of the difference is I knit english to her Continental. 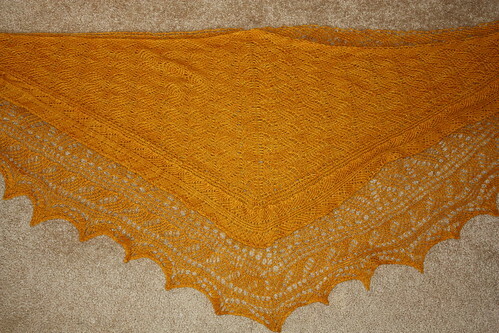 She also did, in fact, until just this last shawl she knit, have MUCH tighter YOs than I do. She said she blocked hers as aggressively as she could and I know I did. Wow, those did come out differently. Though to me it looks like the larger one was blocked more aggressively. That or the smaller one has much tighter yarn overs. This is a great post; the pictures really tell the story! I design a lot of one skein things, and sometimes one skein is enough for me, but not for someone else. You really show us why! I always make sure to have extra yarn in case my gauge is off a bit. I’m learning to be patient and do a gauge swatch as well but sometimes swatches lie.